The «Investment Construction Company «NKS» succesfully finished the construction of the trade complex «Pyaterochka», which is situated on the land plot with the address: 67A, Mosin Street, Sestroretsk town. The general area of the shop is 803m2. The construction works began 6.10.2009 and were completely finished already 16.01.2010. The Company implemented the whole range of construction works up to the delivery of the object on the turn-key basis. 17 January the object was approved and accepted by the State Committee and in two days it was commissioned. 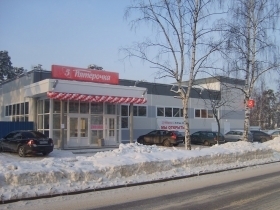 «Pyaterochka» is a Federal retail network. Dislocation of the shop is very comfortable for people who are oriented to the fast shopping near their houses and at low prices.